She turned with a firm and steady step in the direction of Piccadilly Circus. It had occurred to her that women who looked like Lucille Hope never bought their corsets, as Dorothea invariably did, at the summer sales in Kensington High Street. In fact they didn’t wear corsets at all, but foundation garments costing guineas and guineas and fitted on the person, instead of being picked out a great tossed pile on a bargain counter and thrust shamefacedly into an attache case now that the Government wouldn’t allow them to be wrapped. Therefore, thought Dorothea, she would take the bull by the horns and copy their example. At the thought of the fitting-room she quivered with dismay, but what other people had done she could do. And assistants regarded you as that anonymity, a customer, not a person. Like doctors, thought Dorothea. commentary: This is another of the Anthony Gilbert books recommended to me by John over at Pretty Sinister Books: this is his full and excellent review, which you should read to get the full lowdown on the book and plot. I, as usual, will be pursuing some odd and random corners of interest from it. The story starts off in a traditional way: someone has fallen down the stairs and died, in his crumbling big house in the country, surrounded by his unloving relations. So we think we know what kind of book it is. But then there is a drastic and slightly awkward change of plot and tone: we find out that someone not present – Dorothea above – is going to inherit. But she needs to wait 30 days before she can claim the money, and if she dies before then the money goes elsewhere - given that this is such a major plotpoint, I never felt it was satisfactorily explained exactly what would happen. The plot turns into a slightly farcical Ealing comedy: there do seem to be similarities between this and the film The Ladykillers. Someone might be out to kill of Dorothea – who is it? And will they succeed? The comedy is quite heavy-handed, and no-one could ever accuse Gilbert of being warm or sentimental; the words 'ruthless and callous' are more likely to come to mind. Again, Gilbert (who is a woman – that’s a pen name) can be full of snobbish rubbish and knife-edge distinctions of class and honour and good taste: but at the same time she brings tremendous, vigorous vulgarity into her books. The splendid Arthur Crook – series sleuth and shady solicitor – turns up here in his usual endearing way. In some ways the writing could remind you of Barbara Pym – spinsters and their trains of thought – or Miss Pettigrew Lives for A Day – the makeover. But this is a much harsher book than either of these. 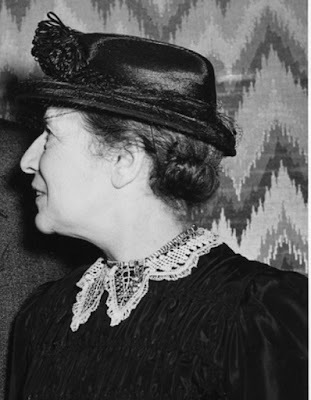 Dorothea is meant to be look very dull before she takes herself in hand – she wears a brown dress, brown coat, brown hat. This picture I think is very nice, and actually shows the great Austrian physicist Lise Meitner - it is from the Smithsonian collection. 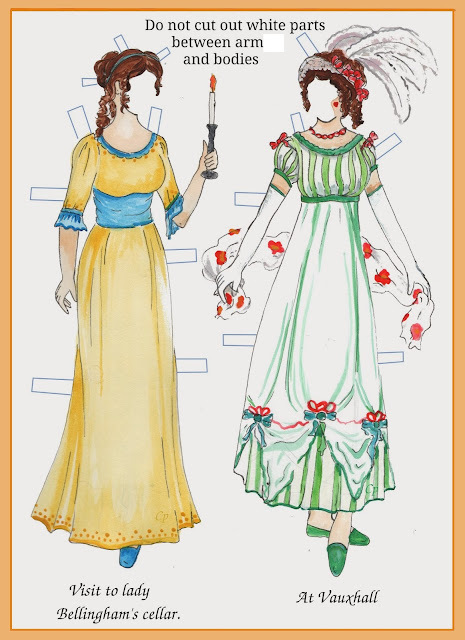 But then another harsh aspect of the book is that Dorothea’s makeover is meant to be a failure, to make her look ridiculous – Hugh’s heart sinks when he sees her turn up at the Berkeley – her clothes are ‘conspicuous, glaring and quite unforgettable’. 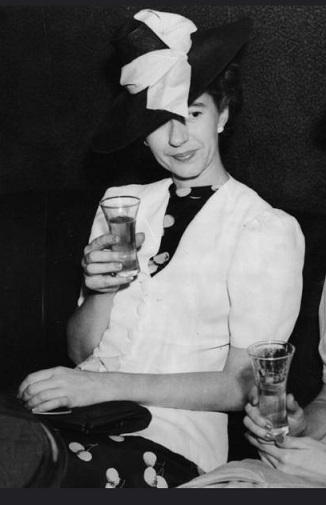 I have chosen this photo (from the State Library of Queensland) – I think she looks splendid drinking her Grand Guignol cocktail, but it’s the kind of outfit that Gilbert would sneer at in her non-vulgar moments. One of the possibly wolf-like relations, Hugh, arranges to meet her and says ‘I’ll wear a green handkerchief Pan-fashion’. It then says ‘Hugh had known that she wouldn’t be able to resist the vision of him waiting for her at at the Berkeley, wearing a green handkerchief, Pan-fashion, whatever that might mean.’ And this is typical of Gilbert, intriguing and odd - but she never explains what ‘Pan-fashion’ might mean, and I have been able to find reference to it anywhere else. When Hugh turns up at the Berkeley he is described as being smart in uniform, but that is all. Cecil bridled. “Perhaps your mother had no children,” he observed sharply. Then perceived the folly of his retort. What I dislike about Gilbert books is that they have strange loose ends and unexplained moments – she picks up ideas and people and then drops them – and that she is very mean about older unmarried ladies. (Even though – yes, Dorothea is 38, not 98). But still there is always great entertainment value in them. There are plenty more of Gilbert's books on the blog - click on the label below to summon them up. 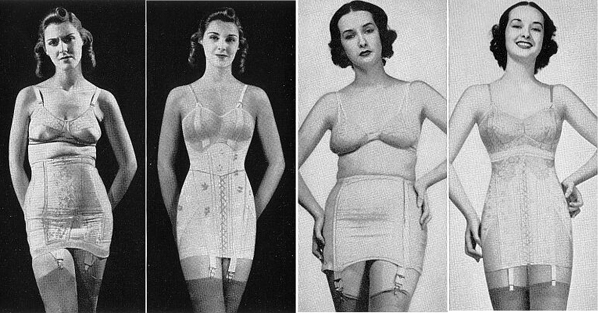 1940s corset pictures from the Lela London blog, where there is a whole page-full of fascinating images, as well as many other clothes-minded items throughout the blog. This does sound like a book with some very hard edges, Moira. But it also sounds as though there's some wit in it, and some entertainment. I'm not usually one to enjoy those little unanswered/unaddressed bits, but still, it sounds as thought there are some good moments in this. I think you have to get used to Anthony Gilbert being a bit casual with certain things! I do enjoy her books, but I have to make a conscious effort to ignore the annoyances. So I must feel the entertainment value is worth it! I have GOT to know what she said about underclothes that was too shocking to publish! There was a 1924 film of Peter Pan, but he was wearing his signature collar. From stills, film looks rather good. Why does Peter Pan wear a white turn-down collar? They were fashionable (and shocking to some) in the year of publication. But perhaps the god is meant - and he wears nothing apart from fur. So do I - and Open Library has let me down, there's no e-copy available to borrow. I'll have to fall back on WorldCat. It never ceases to amaze me how our lone untrained part-time librarian in a tiny township library, in a farm village out on the upland corn prairie, still has always managed to get me every book I've ever asked her for. (Well...all but one. "Les Ameŕicains et les combats de la libeŕation dans le secteur de Haguenau," of which there is evidently only one library holding it in the entire US. For some reason Carlisle Army Barracks didn't want to loan me their copy). Ha ha, you both made me laugh this morning. It is a mesmerizingly weird couple of pages, to my tender sensitivities. If I can find the book again (buried in others right now) I will see if there is something I can quote if I can bear to read it again! Someone sent me on Twitter a picture of Pan at his most foxy, and I did laugh to think of that in the lobby of the Berkeley. Shay, it is absolutely plain that you are the only person aware of the existence of that book, as well as the only one wanting to read it. Yes, well...in January of 1945 my father was mortared, shot, taken prisoner, and then shot (again - the Germans are SO thorough) during the battle for Haguenau, and my trip to France this week is going to include a visit to that town. I'm a bit of a military historian but my focus is on the 19th century so I had to do some reading up. Thanks so much for sharing that Shay, what a wonderful man your father must have been. We owe such a lot to his generation. I hope your trip goes well. Probably another one I can let pass me by. Love the before and after pics. 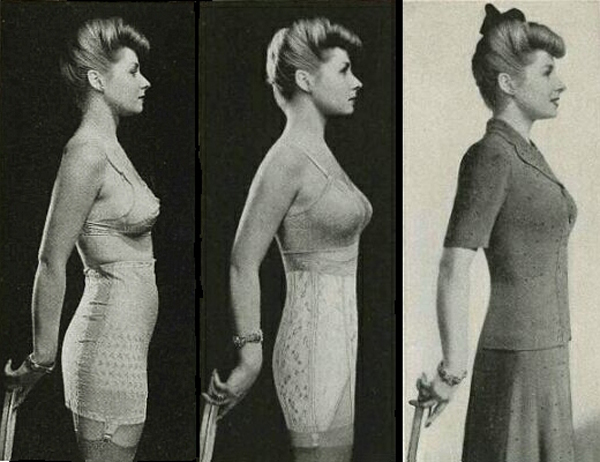 I wonder when women stopped wearing corsets? I suppose it was the 60s. I have got to the age where I do rather see the point of them . . .
60s or early 70s? I remember a character in Coronation St who was a kind of freelance corset fitter around then: I expressed surprise - to me it was as if she'd said she was a 'bustle fitter', right out of period. But I was assured they still existed. In October 1979 when I received my orders to Officers' Candidate School, my packing list included a girdle (and gloves). Of course I had to go out and buy one, as by the late 70's even girdles were on their way out. Interesting that they could organize even your underwear. A girdle and gloves sounds like the title of an exceptionally interesting autobiography. That line about the corset going into an attache case because they couldn't be wrapped is BRILLIANT. Absolute corker. Thanks! I will add this to my list of Anthony Gilbert's books to look for. I have had mixed success with his books so like to have recommendations. I have Death Knocks Three Times on the TBR right now.